Giloy Sat is a traditional Ayurvedic medicine that cures chronic fever, clammy hands, excess perspiration, thirst, hemorrhoids, vaginal discharge, etc. Giloy has very potent antibacterial, anti-inflammatory properties and is a natural antacid. It cures infections, corrects digestive disorders and boosts immunity. Giloy Sat brings to you the goodness of giloy extracted with the care it deserves. 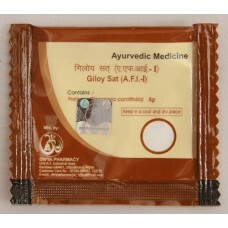 Take Giloy Sat for relief from blood, bone, digestion problems or infections. Experience holistic recovery with Giloy Sat.